Osmosis describes the movement form an area of high concentration to an area of low concentration. 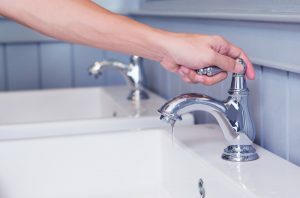 A reverse osmosis system uses pressure areas that are created when your plumbing forces water through a filter that would otherwise prevent water flow. A reverse osmosis system separates the water coming from the municipal supply into two compartments, with a semi-permeable membrane between them, as we mentioned above. The water coming in from the supply side is placed under heavy pressure, which forces the water to push through the membrane toward the low-pressure side. The membrane finely filters out the particles and pollutants suspended in the water, trapping far more contaminants than a standard filter would be able to. Reverse osmosis is very helpful for the quality of your water. Because these systems are great at filtering out salt to balance pH levels. They’re often installed along with water softeners (more on that below), which place salt into the water to counteract the hardness of minerals. Sometimes, the salt levels become too high, and a reverse osmosis system can restore the pH balance, along with removing numerous other undesirable particles. We mentioned a water softener above—but what is hard water? Hard water is water with high levels of minerals in it—namely calcium and magnesium. These minerals are harmless to ingest, however, they can be bad for your plumbing. What happens is that they build up within your pipes, and can create damage to them as a result. There are a few ways to spot if you have hard water. Have you ever noticed white water spots on your glassware and dishes after it comes out of the dishwasher? Or maybe you’ve rinsed your hair in the shower only to have it feel slimy when you get out. These are just a couple of signs that you have hard water. Fortunately, this is easily resolved with the installation of a whole-house water softener. What Type of Water Treatment System Do You Need? Is a reverse osmosis system right for your home? How about a water softener? The best way to find out is by scheduling water testing with our team. We will help determine what issues are impacting your water supply, and help you make an educated decision about the best next steps. Need water treatment help? Contact the super friendly team here at Admiral Plumbing Services, LLC in West Palm Beach, FL. We offer exceptional service!